Here are a few quotes I found on the web regarding tag management and IT departments: Relief of IT department bottlenecks – once the Tag Manager is deployed, new tags can be implemented directly by Marketing with no IT department involvement. This is a huge benefit for large websites, where IT is oftentimes a bottleneck. 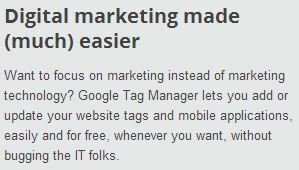 Original text here IT Issues - when you use a TMS like 'Google Tag Manager' you are bypassing the IT department.